At the invitation of Professor Andrew Ferguson, Stephanie Boluk and Patrick LeMieux gave a talk on video game culture and pedagogy as a part of the DH Speaker Series during spring term. They had recently published Metagaming: Playing, Competing, Spectating, Cheating, Trading, Making, and Breaking Videogames and spoke on video game culture and pedagogy. According to Professor Ferguson, Boluk and LeMieux “take things that are on their face incomprehensible and so embedded in cultural baggage and social knowledge and pick them apart so that their readers can know what’s going on.” For example, during their talk, they presented a few seconds of game play and gave the audience the context of what was going on and how that fits into larger cultural questions. Also during spring term, Professor Ferguson taught ENGL 295: Video/Games, which surveyed the medium of the videogame, from the beginnings of the genre in board and card games, through early computing and cartridge-based consoles, through the highly sophisticated online formats of today. The students made games throughout the course, including videogame-related board and card games and digital story games on the Twine platform. Professor Ferguson emphasized that everyone can make and play games and was grateful to have been able to use a room in the library as a console room where anyone could go and play all kinds of games throughout the four-week semester. Professor Ferguson had been interested in teaching video games for a while when a DH incentive grant and spring term’s shortened semester gave him the opportunity to teach exclusively video games and immerse the students in playing video games almost all the time throughout the course. During the course, the students considered the varying experiences that can result from video games. For instance, Professor Ferguson noted that when people play video games, they often default to one type of game and rarely stray from that type. To challenge this tendency, Professor Ferguson gave students different types of games to see what interested and surprised them as they tried things they never thought of as video games before. 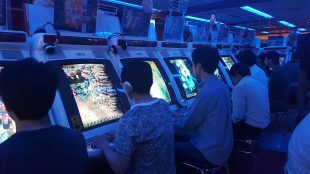 Additionally, the class took a field trip to three different arcades to demonstrate what actively maintaining and creating games could look like. The first stop on the trip was to an arcade in a dying mall, which sparked the question: are arcades dying out? Next, they traveled to an arcade with retro video games, such as Pac-Man, Pole Position and Pinball games, showing that if we take care of video games, even though it is difficult to do so, we can keep them alive. Finally, the class went to Dave and Buster’s, which featured shooting and driving games, showing one possibility for the future of arcades. Considering the future of videogame studies, Professor Ferguson would like to hope that more people are studying games as a source of academic inquiry, akin to literature or media studies. “Studying videogames will become more and more interesting as people move towards playing games as a way of telling stories,” he said. In fact, videogame studies is growing slowly and unpredictably and could become increasingly popular like film or TV studies. According to Professor Ferguson, videogame studies is about five years away from becoming just as popular. Thanks to his spring term class, some students had the opportunity to get a head start. This post was written using an interview with Professor Ferguson. ← Rewriting the Code: Women and Technology–Join Our Creative Technology Cohort!